Guitar from Scratch: Beginning and Continuing Classes. May be repeated. Violin from Scratch: 3 skill levels for absolute beginners through intermediate players. May be repeated. Oud and Middle Eastern Music: 4 skill levels for absolute beginners through intermediate players. Ensembles: We also offer large and small mixed-instrument ensembles for players with various musical interests and at many skill levels. 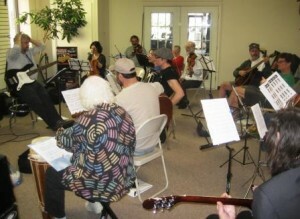 You will find information about our ensembles here. You may register for any of our year-round programs here. If you have questions, please contact us.